The Simms Women's Drifter Tech Henley is a women's henley fishing shirt by Simms that utilizes DriRelease and Tencel Technology and is constructed with 83 percent polyester, 11 percent Tencel and 6 percent Spandex and contains wicking properties, is quick drying, cooling and anti-odor, all wonderful qualities to have in a women's fishing henley shirt. This Simms Women's Drifter Tech Henley shirt is designed with a concealed, fly box compatible, zip-secure chest pocket where you can safely store your valuables or a fly-fishing fly box during your next fly-fishing adventure. 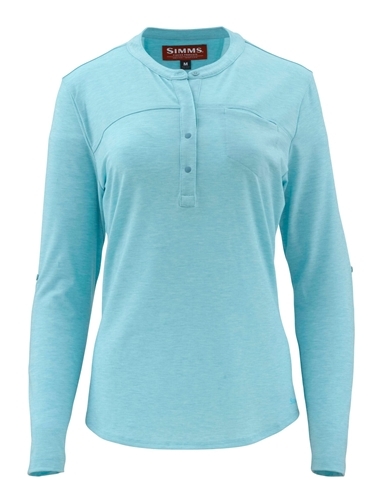 This Simms Women's Drifter Tech Henley shirt also has a welted cell phone pocket and knit lined back pleating for ease of movement as well as a shaped hem. If you're looking for a quality women's fishing henley shirt, then make sure to check out the Simms Women's Drifter Tech Henley. This Henley is lightweight and very soft and comfortable. I've never worn it fishing, just around town. I wear a tank top underneath because I feel it is a little see through. I do love this shirt and am very happy with it.